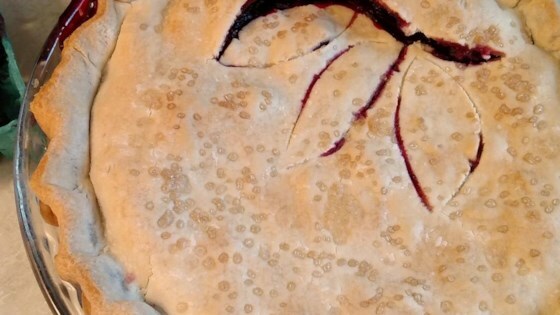 "Marionberries are a sweet blackberry hybrid grown in the Northwest that make a perfect pie!" Mix marionberries, 3/4 cup sugar, flour, and lemon juice together in a large bowl until well-combined. Fit the bottom of a 9-inch pie plate with 1 pie crust. Pour in marionberry mixture. Cover with second crust; crimp edges to seal. Brush pie lightly with water. Sprinkle 2 teaspoons sugar on top. Cut four to eight 1-inch slits in the top crust with a knife. Bake in the preheated oven for 10 minutes. Reduce heat to 350 degrees F (175 degrees C) and continue baking until crust is golden, 45 to 50 minutes more. Let cool completely before serving, about 1 hour. My husband loves this! I am so happy I made it I think the one thing I would do is add some corn startch to the mix. Love Oregon marionberrys I am so happy to have a great recipe for a pie. Great recipe. I did find that I like making two smaller pies with this recipe instead of one big one. Definitely a keeper! I will add cornstarch or tapioca to the filling to make it firmer. Otherwise a very good tasting pie. I used the butter pie crust, which always turns fantastic. Family loved it. Especially my VERY picky husband! !